Analyses and discussions were undertaken over several years by researchers, policymakers and practitioners from a range of countries that vary in their approaches to the curriculum in relation to Computer Science. 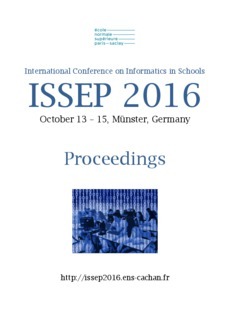 These analyses were undertaken predominantly within the International Federation of Information Processing (IFIP) by the IFIP Curriculum Task Force and at EDUsummIT 2015 and were motivated by a need to examine the rationale, issues and challenges following some concerns across the globe about the position and nature of Computer Science in the school curriculum. We summarise our findings and focus specifically on challenges for the computer science education community in communicating, clarifying needs and promoting curriculum change in order to encourage Computer Science in the curriculum both theoretically and practically.